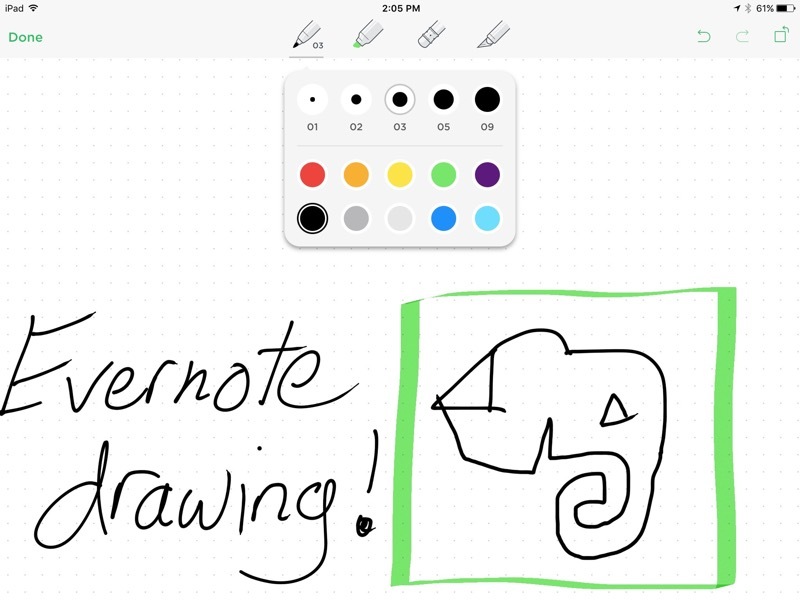 The other major feature in Evernote 7.9 is the ability to add drawings right within the app. Evernote integrated picture annotation features from Skitch long ago, but until recently, you had to use Penultimate to sync any kind of drawings to Evernote. Now that functionality is built right into the app, and can be activated while you edit a note. The drawing tools within Evernote are simple, but capable. The pen and highlighting tools has five sizes and ten colours to choose from, and the eraser can clean up specific areas or reset the page. There’s also a knife tool that lets you cut, copy, and paste specific sections of your drawing. Very handy if you’re trying to quickly mock up several iterations of a scenario. The drawings auto-crop within the note view, so you’ll only see the portions of a canvas with ink or writing on them. If you later edit that drawing, the cropping will also adjust, so your drawings are always formatted and wrapped nicely around the text and images in your note. Evernote’s new features are best for mockups and quick sketches, so you won’t be using it over dedicated drawing apps like Procreate or Sketchbook. Paper is also still the better candidate for detailed design sketches, since it lets me manipulate drawings — and zoom in — more easily. I’d say Evernote’s competing directly with Apple’s Notes app with this update. Notes has a great set of drawing tools, but you’re limited to one drawing per note, and only across iOS and OS X devices. Evernote will let you add as many drawings as you like, and you can edit a drawing at any time, then have it sync to all of your devices across all platforms. What’s more, because Evernote has an excellent optical character recognition (OCR) system, your handwriting will also show up as search results within Evernote. 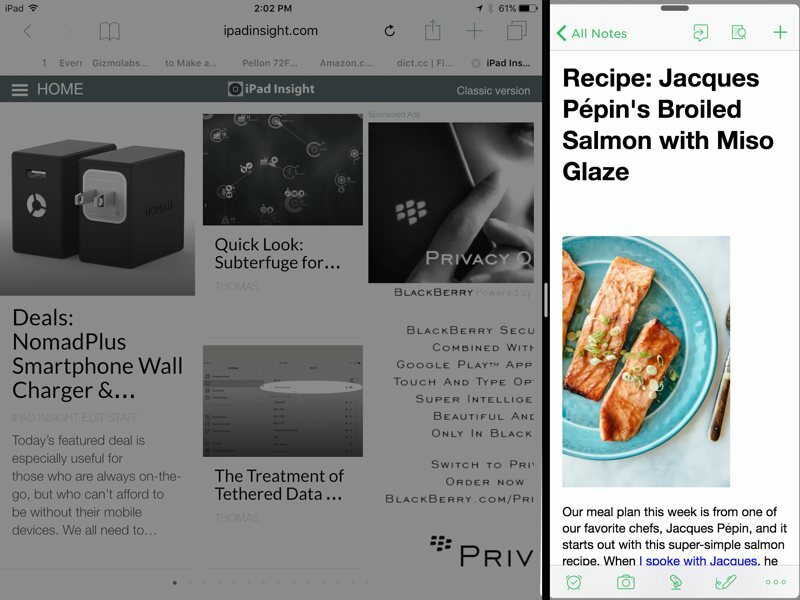 Evernote 7.9 may look like a little dot update, but it was one of the final touches needed to make Evernote a great iOS 9 citizen. We now have great Spotlight search, full multitasking support, Safari View support for links viewed within the app, and 3D Touch features on the iPhone 6S Plus. It took a few updates to get here, but I’m pleased with how well Evernote has embraced the new capabilities of iOS 9. My final wish at this point is to see some keyboard shortcuts added in the next dot update. I’d like to view Notes, Shortcuts, Notebooks, and trigger search with keyboard shortcuts within the app.